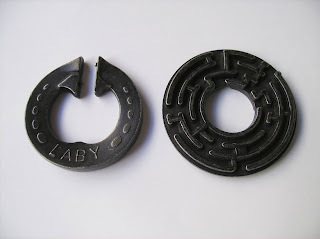 The Cast Laby is another fantastic puzzle from the 19th century Britain, revived by Nob Yoshigahara in 1997 for Hanayama's Cast Series. 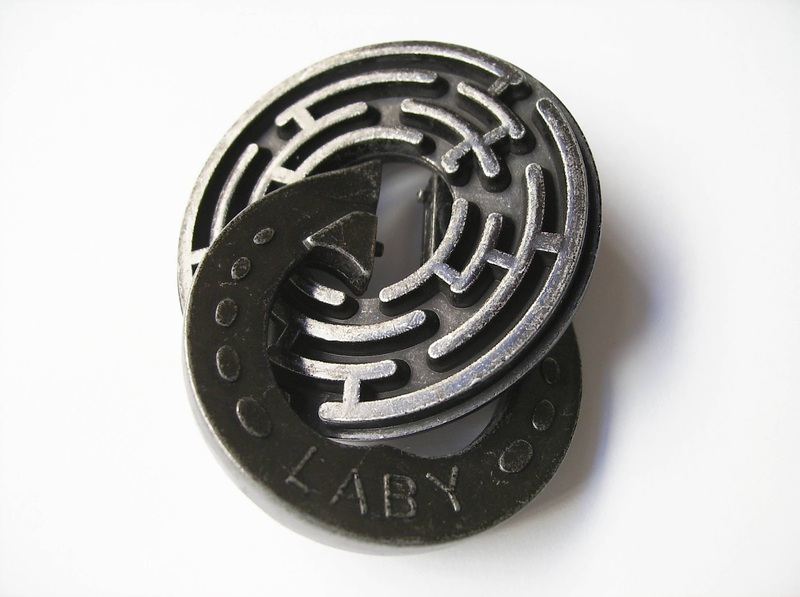 The Laby is a fascinating concept where two different labyrinths need to be navigated simultaneously. Sounds mind-boggling, right? - And the truth is it's actually a very difficult puzzle, so expect pretty frustrating moments when you're attempting to solve it. If I didn't know it was Nob's work, I'd say it would be something Oskar van Deventer would've designed. His Cast L'œuf has a rather similar concept with the same "two opposite mazes need to be navigated simultaneously" approach. In the Cast Laby you're faced with a ring that has an opening and two pins at different positions, which will be used to navigate through the labyrinths' paths. The ring starts at the center of the maze and by choosing one of three possible entering points, you have to find the right path to free the ring. The other two openings will only lead you to a dead end, so be careful. 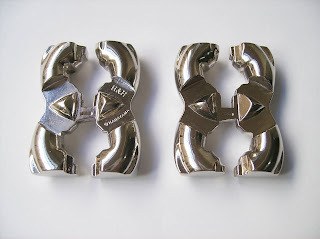 Hanayama rates the Laby as a 5/6 and this time, I actually agree with them (rare occasion). It took me approximately an hour to finally see the ring out of the maze... While you may think an hour to solve a puzzle is not so bad, try doing it when you start feeling frustrated by falling into the same dead ends over and over again, and after a while 10 minutes seem like an eternity. Solving the Cast Laby is like trying to coordinate, at the same time, two teams walking into different directions, while having to reach the same exact destination. There will be times when you need to go back in one direction to make the other pin advance forward. The hardest part is to keep track of where you are at all times in both mazes, which is easier said than done... The most frustrating part is when you need one pin to move forward and the opposite maze doesn't let you go any further - That's when you know you've hit a dead end and you need to go back and try a different route. More often than not I found myself trying to understand which pin I was navigating with, because I was constantly flipping the puzzle up and down. Later, I found that there's an easy way to tell them apart by looking at the grooves on the edge of the ring opening or simply by having the "Laby" or "Hanayama" engravings facing you, depending if you're left-handed or right-handed. After you successfully remove the ring from the maze, you need to put it back in its original position, so if you don't remember the exact path you took, it's going to be a tough task. This is a nice puzzle to go back to after a while, because you probably won't remember the maze and the right path. As I said in the beginning of the review, this puzzle is fascinating. The genius behind this concept is so brilliant that it's hard to grasp the true effort that went into making this puzzle. Thanks to Nob Yoshigahara we have now the opportunity to experience this fantastic puzzle in its full glory, which otherwise would be very difficult to come by. Availability: You can get a copy of the Cast Laby at Sloyd.fi, and if you're into the Cast Series you can find there all the others as well. elogIQ is a company based in the USA and founded by mathematicians, educators and psychologists that work together to bring us original and creative brainteasers. Dror Rom, inventor of the Cmetrick Classic, which I'm reviewing today, patented his creation in 2004 and since then three other versions have been produced by elogIQ: the Cmetrick Classic Mini, the Cmetrick Too and the Cmetrick Too Hard. 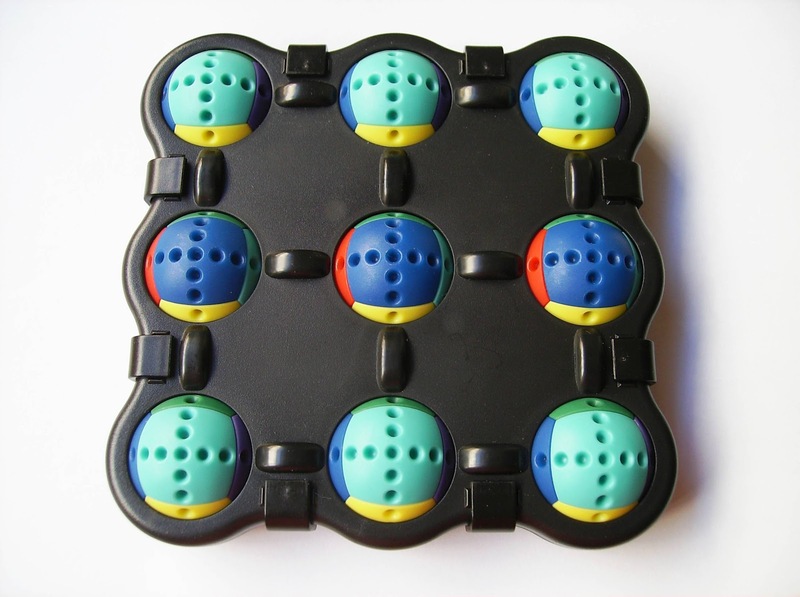 The Cmetrick Classic is a sequential movement puzzle consisting of nine identical spheres arranged in a 3x3 frame, with each sphere having six different colors. 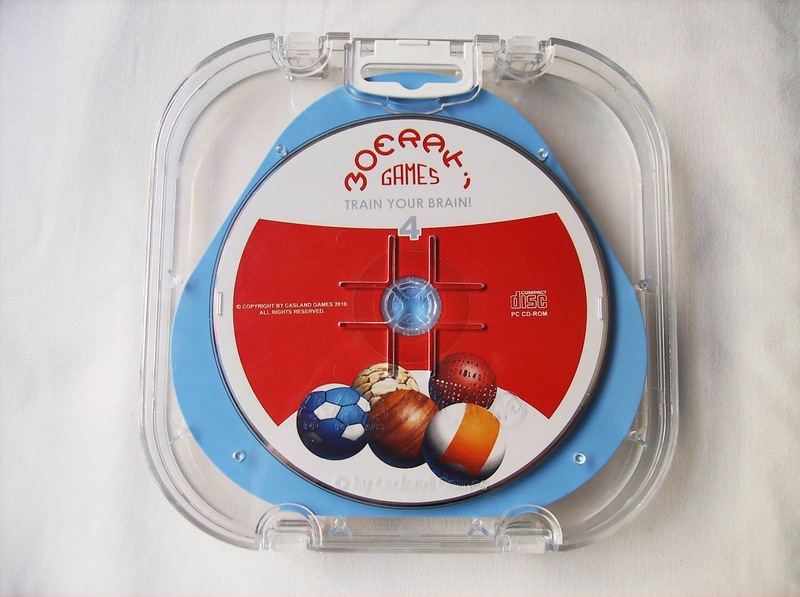 The mechanism of the puzzle is comprised of twelve cogs that connect the spheres in such a way that when you rotate a single sphere in one direction, all three spheres pertaining to that same direction will rotate in sync. For example: if you rotate the top left sphere horizontally (left or right), only the three spheres in that row will rotate as well. On the other hand, if you rotate that same sphere in a vertical direction, then only the spheres in that column will move. 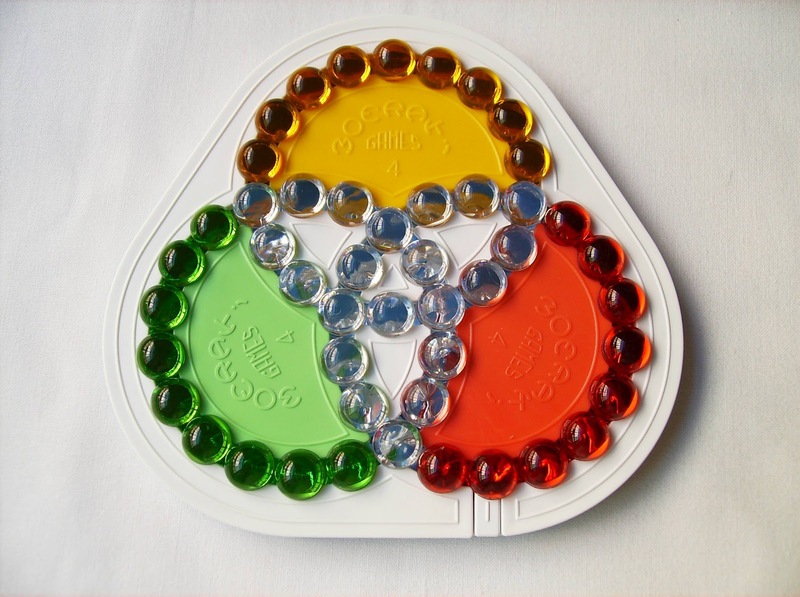 The object is to mix the spheres and then return then to the same orientation with all colors pointing to the same direction. The designer of the puzzle knew of this setback in the mechanism and thought of a simple way to fix the problem, instead of leaving you with a broken puzzle. On the edges of the frame there are clips holding the two sides together. These are very easy to come off and when you do so, just hold the sphere that is not out of sync and by rotating the one that is, you should be able to fix it. 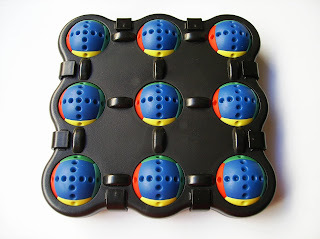 With the out-of-sync problems out of the way, let's move along to the actual playability of the puzzle. Getting the spheres all mixed up is a piece of cake and actually quite fun. The challenge begins when you try to get them in their original arrangement. To get a good sense of the puzzle and how the sequential algorithms play, you can attempt to solve it by the top color only, regardless of the orientation of the side colors. After practicing this less complex task, you can move on to the actual challenge by getting all colors with the same orientation. There are much more complicated sequential movements here and even for me they're a bit tough to grasp. I've managed to eventually solve it, but not in a way that can be solved again without a struggle. I wish the mechanism of the Cmetrick Classic was a bit more sophisticated, but jammed movements and out-of-sync problems aside, it is a fun puzzle to play with and a great challenge if you love this type of brainteasers. If you can get past these minor issues, it's well worth a try. 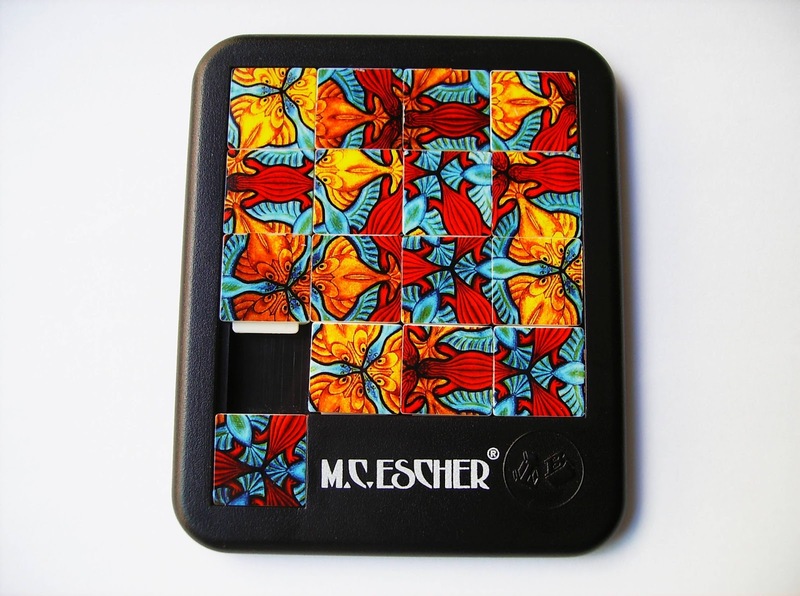 Availability: The Cmetrick Classic as well as all the others by elogIQ can be found at PuzzleMaster. Jaap Scherphuis has a comprehensive analysis on this puzzle and a step by step solution at his website. Check out this animated video of a Cmetrick Classic being solved. In honor of the recent IPP 32 that took place in Washington DC a couple of weeks ago, which unfortunately I didn't attend to, I decided to review one of the past winners of the 2001 Puzzle Competition, the Arrow Case by Dai Nagata (a.k.a Edi Nagata). He also entered another puzzle in that same year, the Pencil Case, although it was the Arrow Case that won the Jury's First Prize. The Arrow Case is no more than a simple packing puzzle where the pieces don't occupy the entire area of the tray, but sometimes simple is perfect, and this is one of those cases. 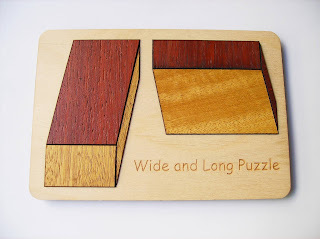 The puzzle has only four arrow-shaped pieces and two distinct frames on the tray for two separate challenges: One is square shaped, easier to solve, and the other, a N-shaped rectangle is a much harder and complex challenge. 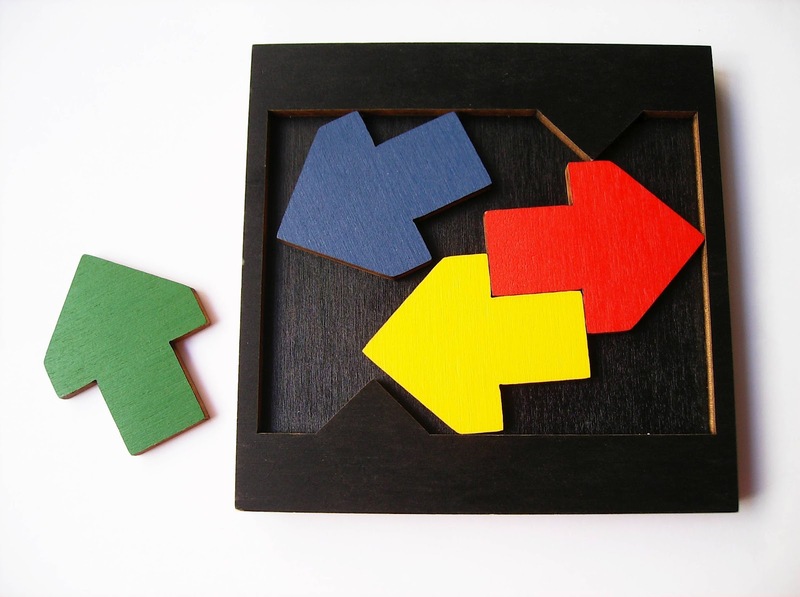 Both frames require all four arrows to be neatly packed with little to no space left to wiggle around. What captured my attention right away in this puzzle was the colorful arrows. Each one has a different color, which in turn, make a great contrast with the black case. 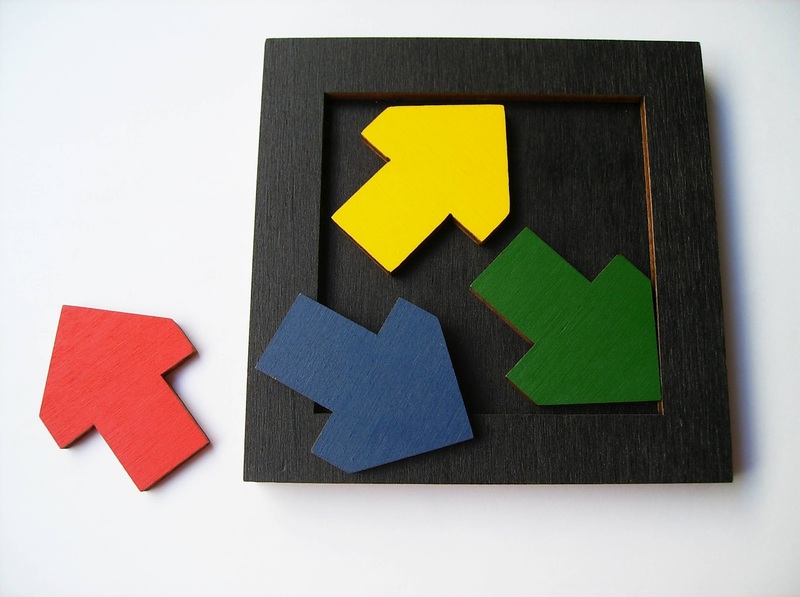 Both the case and the arrows are manufactured in MDF board, which by the way makes the puzzle very light weight. The case measures 132 cm (5.12") and the N-shaped frame measures 11.9 x 8.9cm (4.69" x 3.50"). Also, each arrow measures 4.7cm in width and 5.9cm in height (1.85" x 2.32"). Like most packing puzzles, at least the best ones, the solution is most certainly counter-intuitive and will leave you scratching your head in frustration. The easy challenge, where you need to pack the arrows in a squared frame is pretty straightforward. Here, you probably won't spend more than five minutes to discover the correct arrangement, but it might take you by surprise... The real challenge however, is to pack the arrows inside the N-shaped frame. There are two opposite small triangles at the edges of the frame that will interfere with your efforts and block your movements, but the trick is to take advantage of these very same parts. I have lost count how many times I tried to solve the puzzle until I finally managed to pack all arrows, but it must have been a few, since I always came back to it whenever I felt a bit of confidence, only to see it shattered moments later. This puzzle is not even supposed to be this hard, though: Sloyd, the online store where I got it from, classifies it as a medium difficulty level, so it's not as if you're before a herculean task... I guess this puzzle almost got the best of me, but I was eventually able to get the best of it instead. Solutions: Click here for the easy challenge solution and here for the hard challenge solution. The Jury's First Prize at the 21st IPP was definitely well deserved. Mr. Nagata designed a brilliant and a very original puzzle worthy of every prize, and he didn't stop there. 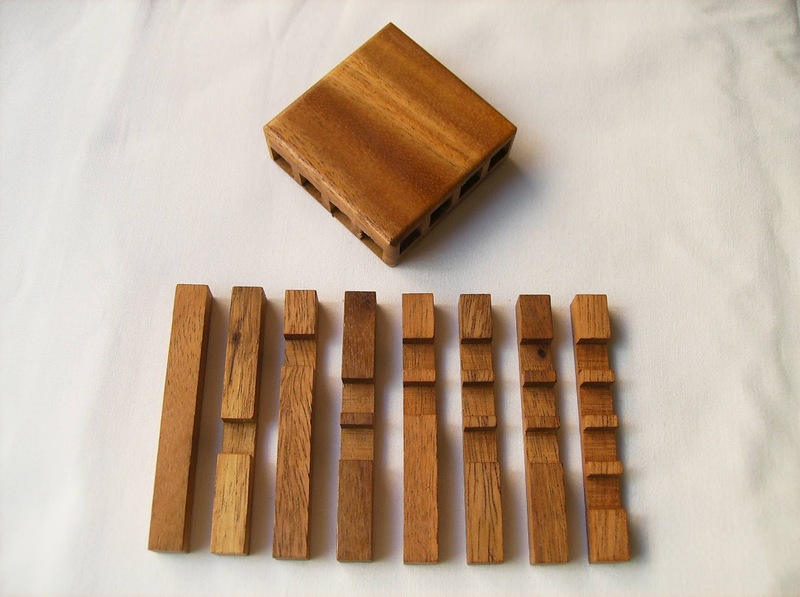 At his website, you have available five other similar puzzles where you also need to pack identical pieces into a case. I highly recommend this one to any packing puzzle fan. Availability: You can get a copy of the Arrow Case puzzle at Sloyd.fi for €17. 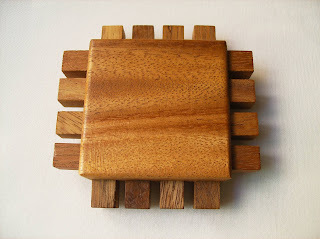 Dan Gilbert became a household name in the puzzle community back in 1991, when he invented the world's most popular edge-matching puzzle, the Triazzle. 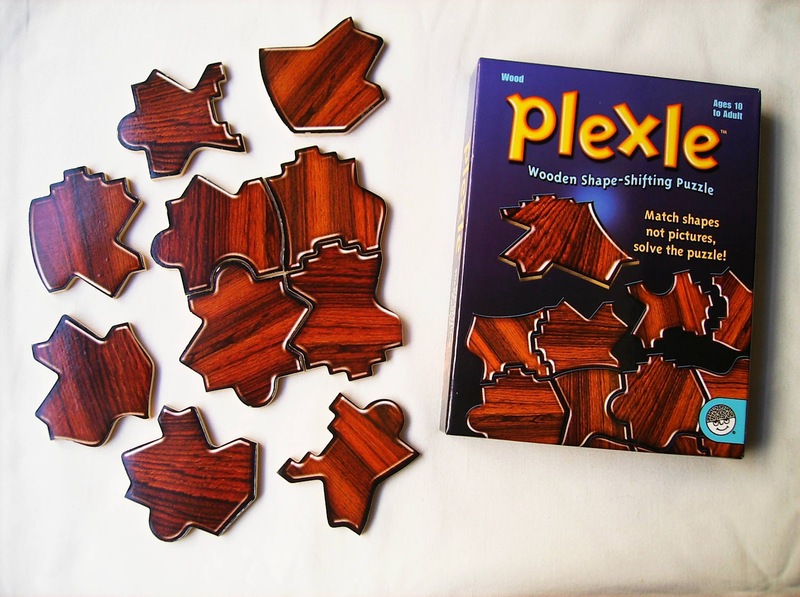 His most recent creation, the Plexle Puzzles, are a series of six edge-matching puzzles where each one has a different theme. When I first saw this new series of puzzles and learned that they were also designed by Dan Gilbert, I had to include one with my latest PuzzleMaster order, since I enjoyed the Triazzle so much. I went for the Plexle Puzzle with the Wood theme, but there's also Fire, Gold, Water, Stone and Space themes. As I understand, the other themes differ a little in shape design, although some shapes do appear to be similar. Currently, PuzzleMaster doesn't carry the Space one, but I'm sure it's just a matter of time. The Plexle consists of 16 wooden pieces, all dissimilar, showing different shapes in its edges. You need to match all the pieces in a 4x4 square, but keep in mind that only the shapes matter, not the orientation of the pictures. There's only one correct solution, so you might need to experiment a little. The design of the pieces is done by gluing stickers to the surface, simulating the wooden texture. The sticker job is nicely done, so you won't have to worry about stickers peeling off. Curiously enough, the wooden theme is actually made with plywood, but so are the other five themes, as only the stickers change... It would've been nice to have the Gold theme made with actual gold pieces, wouldn't it? 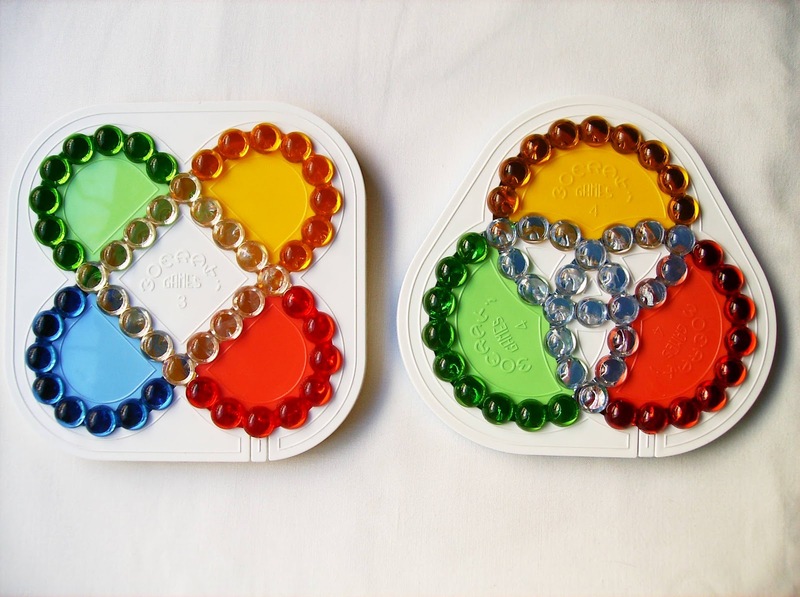 In my opinion, these puzzles were poorly manufactured, for one simple reason: The pieces don't quite match as they should be when two apparently compatible shapes could make a perfect fit. Instead, only the actual piece belonging to the solution will match exactly with the opposite shape, so all you have to do is find the perfect fit. It's a shame, because what could have been a challenging puzzle, became just a trivial task. 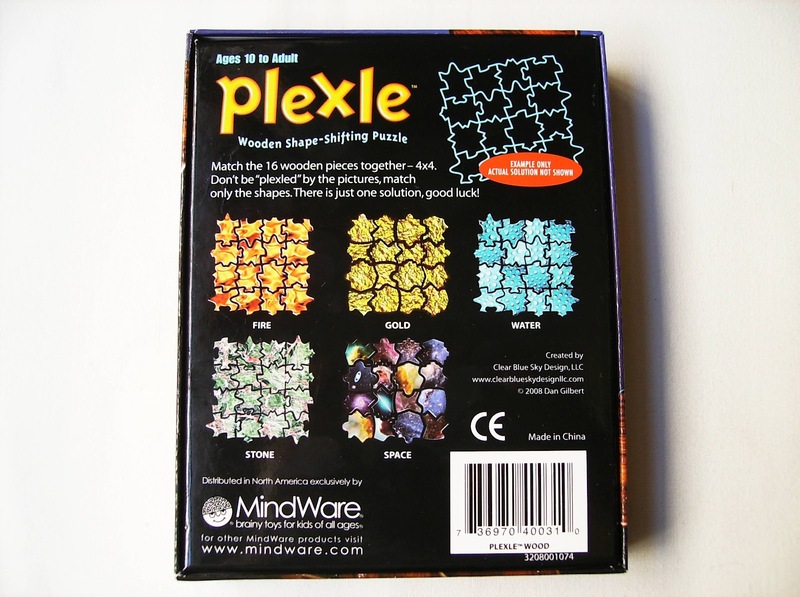 The Plexle Puzzles are a classic example of a great concept ruined by poor manufacturing work. The cuts in the pieces aren't perfect and that spoils the whole experience. I believe this could have been avoided, had they chosen cardboard instead of plywood - Works better in this type of puzzles. You can still enjoy playing with it, and if you happen to fail to discover its real problem, which I highly doubt it if you're an experienced puzzler, it might take you a while to solve it... Otherwise, they're just mere collectible items. Sorry Dan, but I still prefer my Triazzle. Availability: You can find the Plexle Puzzles at PuzzleMaster at $17 CAD each. Besides Nob Yoshigahara and Akio Yamamoto, Oskar van Deventer is one of the designers who contributed the most designs for the Cast Series. 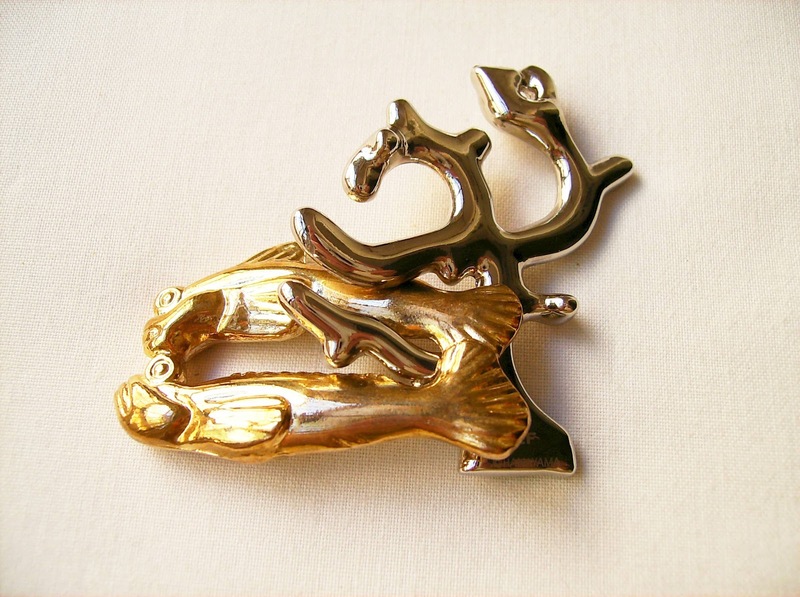 His genius has created many of Hanayama's most popular puzzles, such as the Cast O'Gear or the fiendish Cast Equa. The one I'm about to review, the Cast H&H, was released in July 2010 and it's another tough nut to break. The theme for this one is "Entwine". As you can see, the H&H puzzle is nothing but two apparently identical H-shaped pieces entwined together perpendicularly. They're as much entwined as they can be. You have the tough task of figuring out the correct sequence of movements to separate both H's and then to get them back together. The design really catches your attention right away, as if it were some kind of art piece. This is what distinguishes Oskar as one of the most talented puzzle designers out there: He not only comes up with these outstanding concepts, but he also perfects his designs to stand out from the rest. 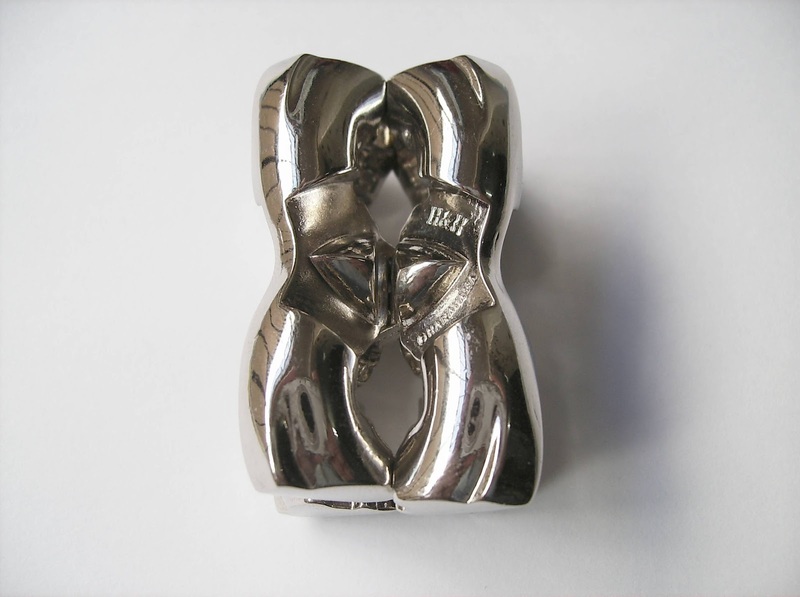 As a trademark of Hanayama's Cast Puzzles, I would've loved to see each piece with a contrasting color (silver and gold), but seeing how the puzzle was built, I'm assuming it was made on purpose just to fool you to think the pieces are identical - Which they're not. The H&H is a Hanayama level 5/6, just shy of the most difficult tier, but even after spending half an hour or so solving it, I still think it's not on the same level as the Cast Equa or even one of the most difficult Cast Puzzles, the Vortex, both of which from level 5. In my opinion, even some puzzles in the level 4 were harder than the H&H: the Marble and the Donuts, for example. Difficulty aside, the H&H is still quite challenging and irritating at times. I found myself countless times doing the same thing over and over again. When I thought I was making progress and close to finally separate the pieces, another movement was blocked by one of the several dents that didn't fit the grooves. There are several different movements you need to perform before you can finally say "Eureka!" and only after shouting a few profanities at the puzzle. Most of the movements are intuitive, except for the middle rotation, where you basically rotate one of the pieces by 180º, and probably the very last one where you get the pieces out - I won't say too much about it so I won't spoil the fun, but you need to do a little twisting. Getting the pieces back together is equally challenging, because you need to make the same sequence of movements, except this time it's backwards. 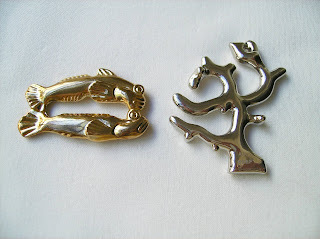 Only when I first saw the pieces separated, I noticed that they're indeed dissimilar and not identical like I thought. It's a little hard to notice it when the pieces are still entwined, but that's what makes the puzzle so interesting - It keeps you asking "Why is it so damn hard?". I would also say that this is one of those puzzles that can still be rather challenging when you attempt to solve it multiple times. I reckon you need several tries before you know all the necessary movements by heart, which is nice, because you get to play with the puzzle longer than you'd expect. Any of Oskar's puzzles always gets high praise, and the H&H is no different. The concept is not entirely a novelty among Oskar's puzzles, but its original appealing design is a welcoming addition to the Cast Puzzle family. Availability: You can find the Cast H&H and the others in the Cast Series at Sloyd.fi. Today's puzzle is a little different in a sense that it's not really a puzzle, albeit it puzzles your mind just as much as any other puzzle. It's not a magic trick either, although some folks will think of it that way. It's called the Wide and Long Puzzle and it's simply an optical illusion that plays with perspective very well. 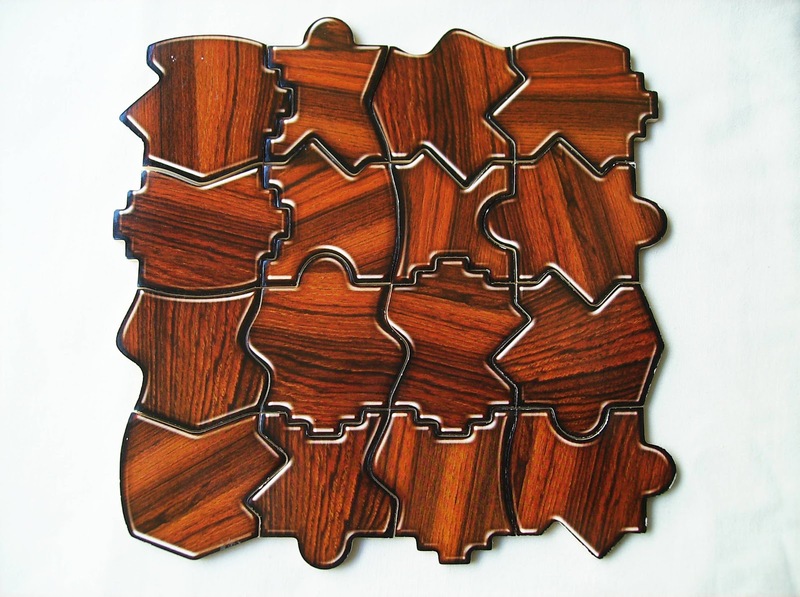 There has been many versions of this puzzle, but the one I have here, made of wood, was manufactured by Jean Claude Constantin and looks stunning. 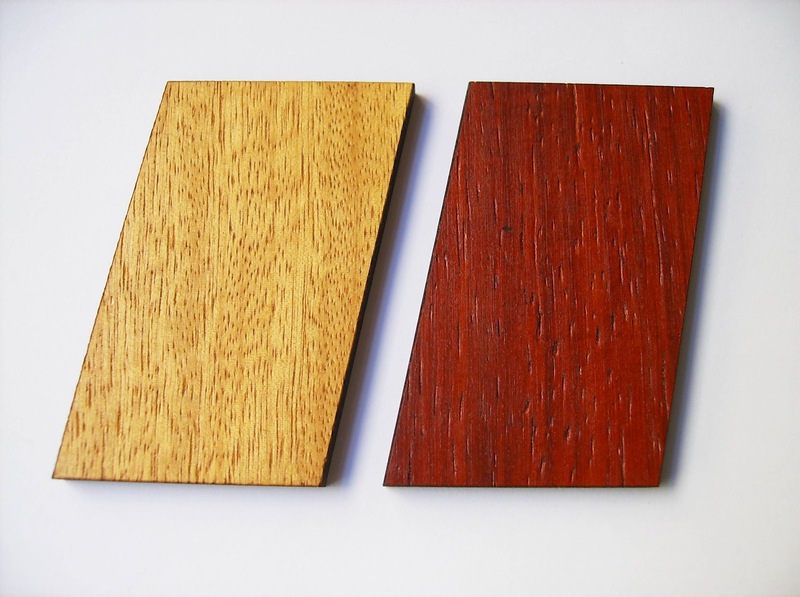 The concept is no more than two pieces of wood, part of two boxes seen in different perspectives, which appear to be of different sizes: One box appears to be longer and the other looks wider, when in reality both main rectangles have exactly the same dimensions. This is rated by PuzzleMaster as a level 7/10, but honestly, I'm not sure what's there to classify as a level of difficulty. As a mere optical illusion, I don't see the point in rating it as "Challenging" - It's something to experience rather than to challenge you... Unless you don't understand how perspective works, which I'm sure you were thought in 8th grade. 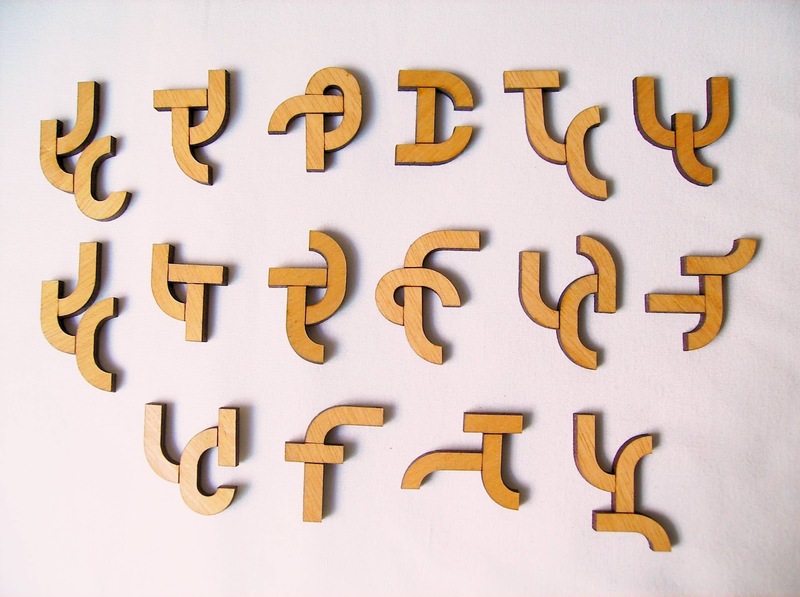 As mentioned above, there have been several versions of this puzzle, and if by any chance you can't get your hands on one of these, you can simply make one out of paper or cardboard, as the effect would be just the same. Keep in mind that only the two main rectangles need to be the same size. The other parts of the boxes can have different dimensions, as you can see from the photos. The Wide and Long Puzzle, which by the way has a deceiving name, because it's not a puzzle in the traditional sense of the word, is a fantastic experience and something that will sure intrigue many of your friends and relatives. It's something that you should have on your desk, as it will certainly be a starting point to some interesting conversations. 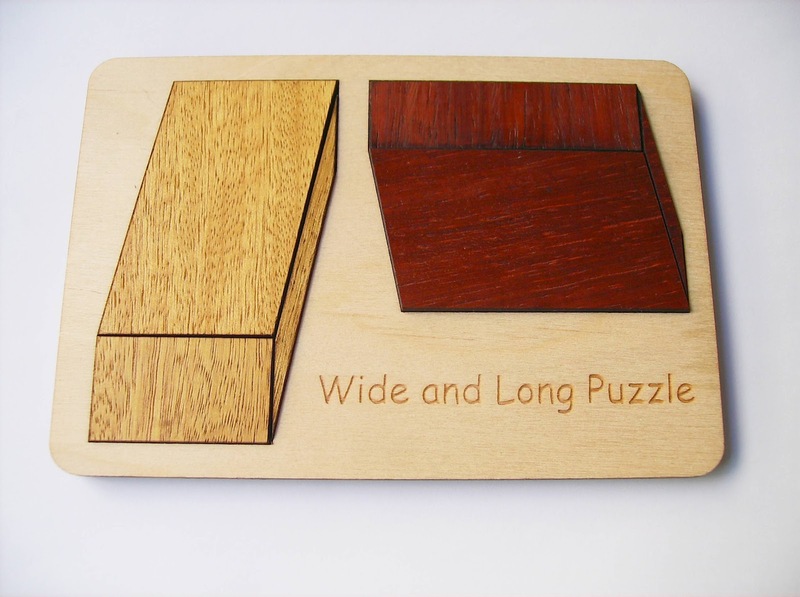 Availability: As of the time of writing, the Wide and Long Puzzle is currently out of stock at PuzzleMaster. You can keep checking the site regularly, because they stock quite often, or you might want to contact them and ask for a restock date. If you like optical illusions, then you're love this website. Last week, I reviewed Hanayama's fifth Cast Puzzle from the Marine Series, the Reef, and today I will finish the task by showing you the last in the collection, the Seabream. As the other five in this collection, which were first released between 1999 and 2000, the Seabream was re-released in 2008 in its full glory with a shinier finish. Akio Yamamoto is the designer behind the Marine Series. The Cast Seabream shows two fish getting tangled up together, and as you'd expect, you have to separate them and then join them together again. 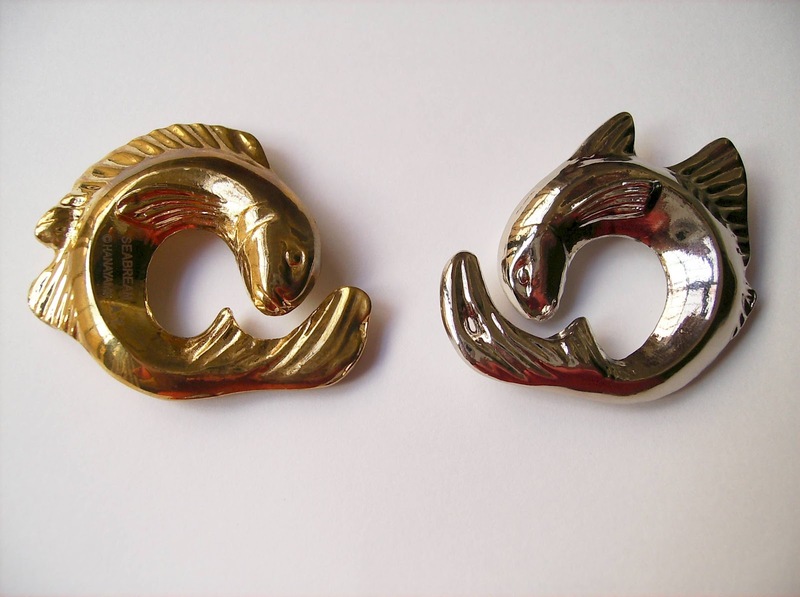 The shape of the two fish are almost identical - except for a couple of dissimilarities in their back fins - which hints that they share the same point of exit. 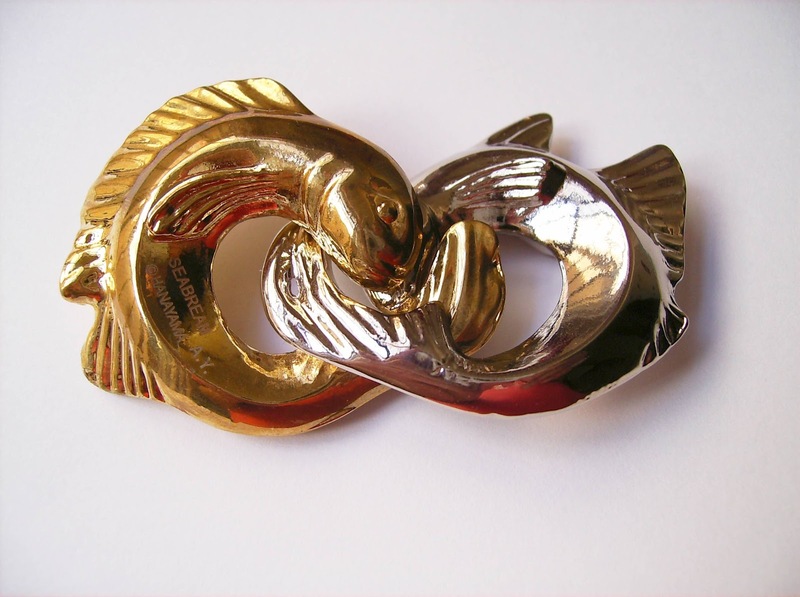 As a nice finishing touch (a Hanayama hallmark), the two fish are coated with two contrasting colors, gold and silver. This is one of the easiest Cast puzzles, rated as a 1/6, so unless you like to collect them, there's really no challenge in solving it. When I picked it up for the review, I didn't remember which level it was, as I have the entire Cast Puzzle collection, and with time it's hard to remember all of their correspondent levels. Nevertheless, when it took me about a couple of minutes to solve, I suspected that it was indeed a level 1 or 2, at the most. As I pointed above, the fact that both parts are practically identical, the way they're solved is pretty much symmetrical - Not that this would be true for all puzzles, though. When I first tried it, I didn't notice this symmetrical feature immediately and focused on just one of them to try and free it. After rotating one of the fish to get both bottom fins lined up, the puzzle all but solved itself. Getting it back together was equally unchallenging, because it's like when you know how to do a trick - Once you see it, it's as simple as connecting two Lego blocks... And even if you'd do it a year from now, you'd still remember how it's solved. Solution: Click here to see a video solution of the Cast Seabream. The Cast Seabream, despite being a level 1, is not a puzzle to be missed, especially if you're a fan like me. It's a nice puzzle to get started into the Cast Puzzle craze. 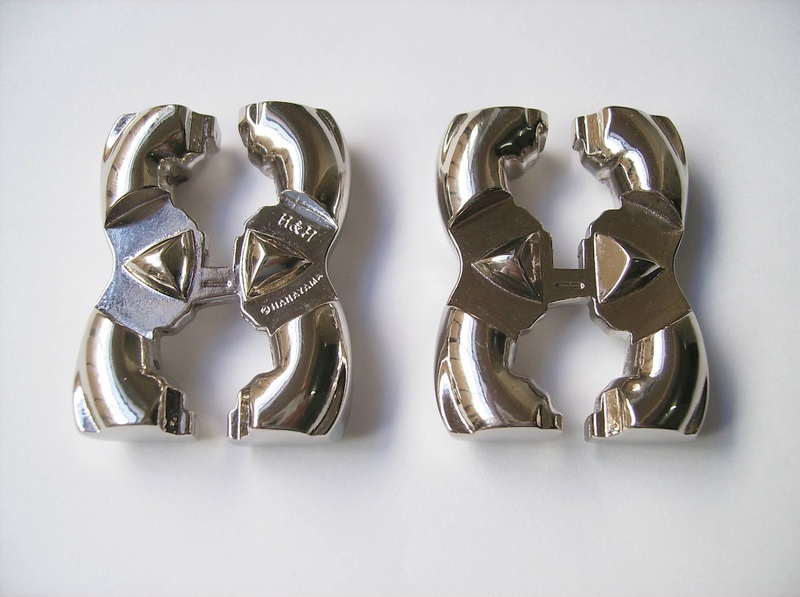 Hanayama's Marine Series was never about tough and complex puzzles. They're more like collectibles and a complement to the main Cast Puzzles. The first thing you notice when you see a Cast Puzzle is its flawless appearance, almost like a piece of art, and the Marine series accomplished this perfectly. I would love to see more Cast Puzzle themed collections in the future. I know that there's the Disney themed puzzles, but they're not new puzzles per se, only design modifications. Availability: You can find the Cast Seabream at Finland's Sloyd, as well all the other Cast Puzzles. If you're familiar with the work of Maurits Cornelis Escher (best known as M.C. 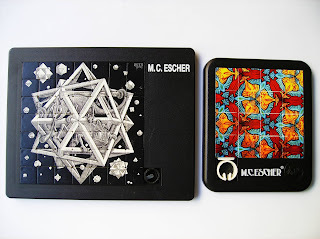 Escher), then you've probably seen several puzzles that depict some of his best pictures. In my collection, I have a few of these and today I'll show you a couple of them, one of which is my most recent acquisition from PuzzleMaster, Birds, Fish and Turtles, produced by Loncraine Broxton - The Lagoon Group. This is basically a classic 15 Puzzle slide concept, except instead of numbers you have to work with a picture, which by the way is a lot more difficult to solve. Actually, there are 16 tiles, but in order to mix and solve the puzzle you need to slide down one of the tiles to get an empty space. 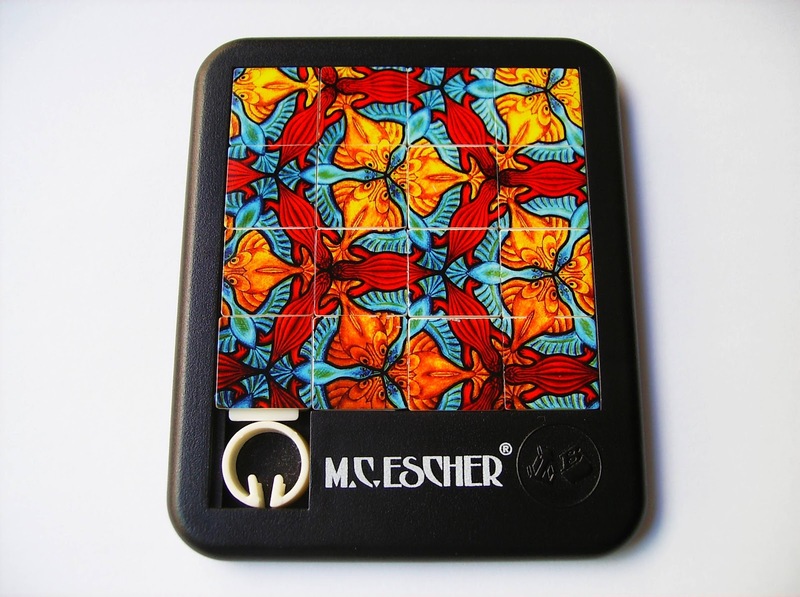 The drawing used in this puzzle is from Escher's Symmetry collection, which features some of his most impressive work. This is actually one of a six puzzle collection currently available at Puzzlemaster. 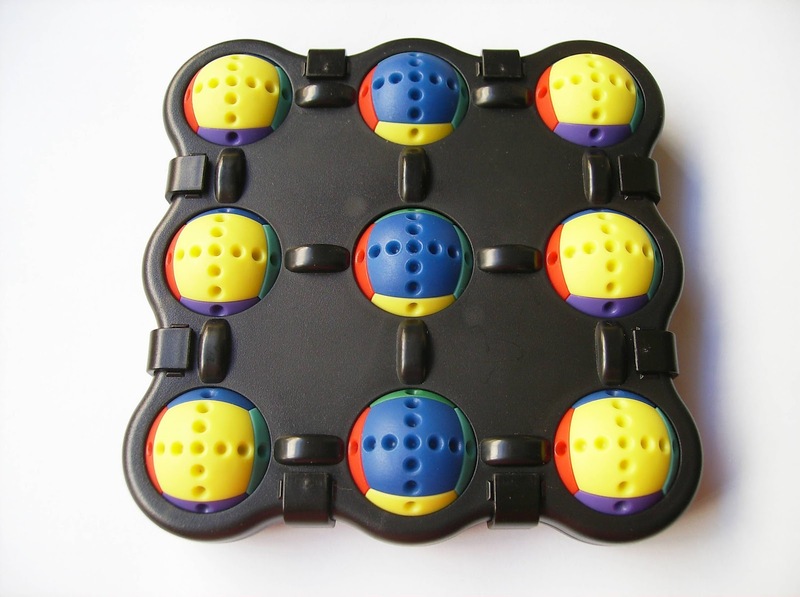 Despite its very affordable price, this is a high-quality sliding tile puzzle. It measures 11 x 9cm (4.3" x 3.5") and the tiles are painted and coated with a glass-like finish, which produces this extra shiny appearance and smooth surface. The tiles also slide very well and jamming is almost non-existent, unless you have any tile misaligned. PuzzleMaster rates this as a level 7/10, but this will very much depend on your skill at solving sliding puzzles. If you can solve any 15 Puzzle with very little effort, then this one is just a tad more difficult, considering you're visualizing picture fragments instead of numbers, and you need extra time for thinking which ones match each other's edges. The hard part is memorizing the picture in order to solve it once all tiles are mixed. Since this is a symmetrical picture and there's no particular beginning or end, you have to rely on memory to know which tile is first. Then, it's just a matter of matching the fragments to make the whole picture again. If you find yourself stuck at times, there's a small black and white picture at the back with the drawing, to help you visualize where each tile goes. PuzzleMaster doesn't offer you a solution, but I think you won't be needing it. If you're having trouble with the sliding puzzle concept, you can find numerous tutorials online about the 15 Puzzle. The Birds, Fish and Turtles is a wonderful collector's item and if you really like the concept and idea of M.C. Escher puzzles, there's five more to collect. For any slide puzzle fan, what more can you ask? Availability: The Birds, Fish and Turtles is available at PuzzleMaster for just $7 USD, as well as the others in the collection. For more M.C. 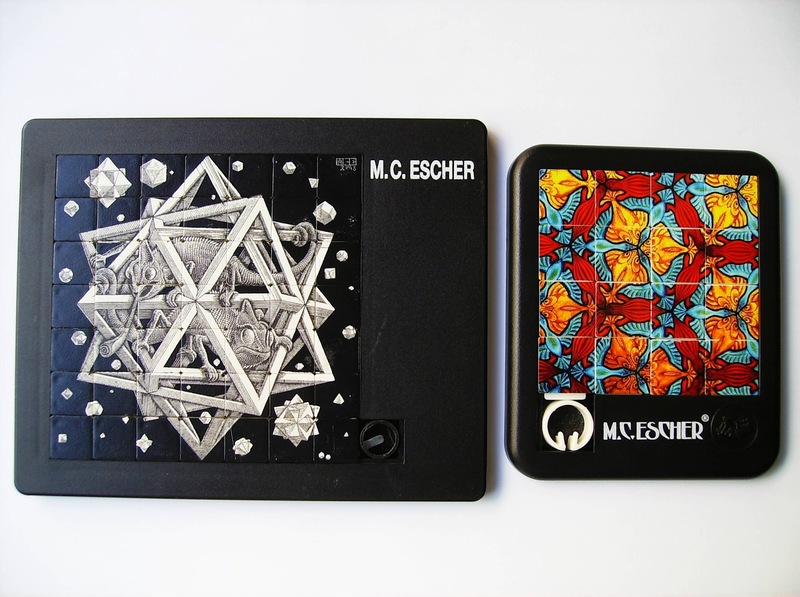 Escher or Escher-like puzzles, check out this page. Most of you, who read my blog regularly, already know the Moeraki 3, which I reviewed a couple of months ago. Refer to that review for more details. This time, I will show you the other version, the Moeraki 4. 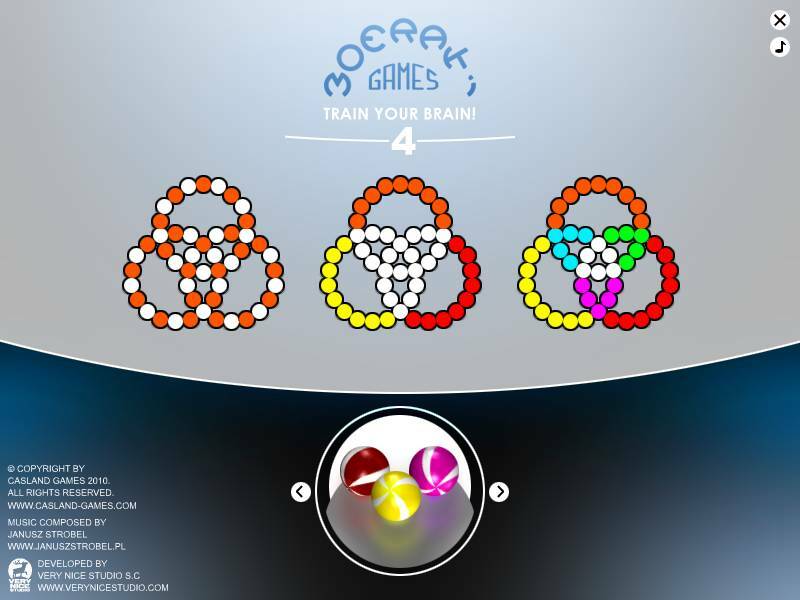 The Moeraki games are a collaboration between Mr. Ivan Moscovich and Mr. Kasimir Landowski, who presented the revamped puzzles at the 2008 Nuremberg International Trade Fair, and are being produced by Casland Games. As of now, only two versions of the games have been physically produced, but there are three more available as virtual PC games, with iPhone, iPod and iPad versions as well. 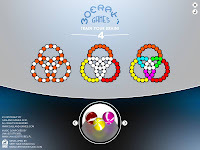 As a sliding puzzle, the Moeraki 4 has a similar concept to the popular Hungarian Rings, although a little more complex. 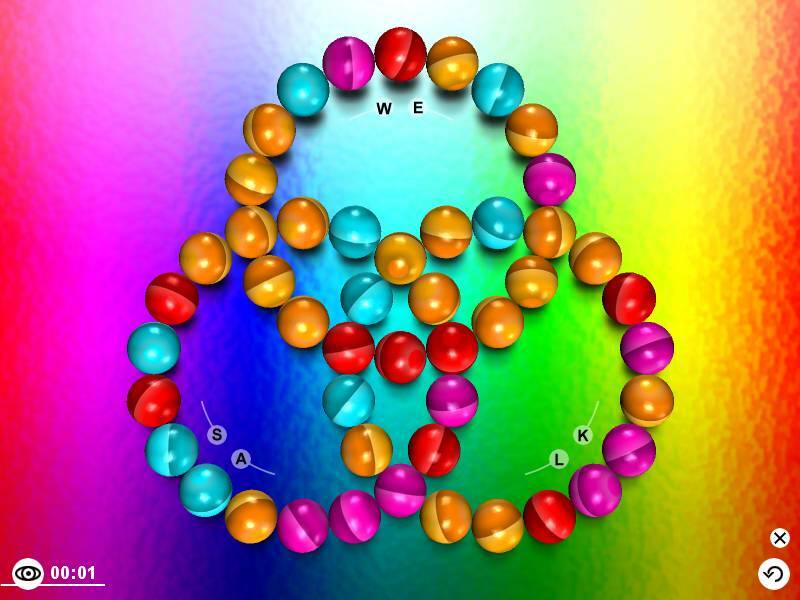 There are three intercepting rings instead of two, and six points of interception instead of just two (Moeraki 3 has four points of intersection). 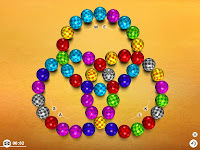 The puzzle consists of four different colored beads with three of them (yellow, red and green) belonging to the outer parts of the rings, while the blank beads belong to the inner parts. The object is simple: just mix the beads and then try to return them to their original color spaces. The design of the Moeraki is strikingly beautiful: One of the best-looking puzzles currently on the market. 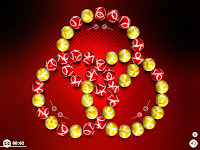 The beads create a great visual effect with their shiny surface and their movement is rather smooth. 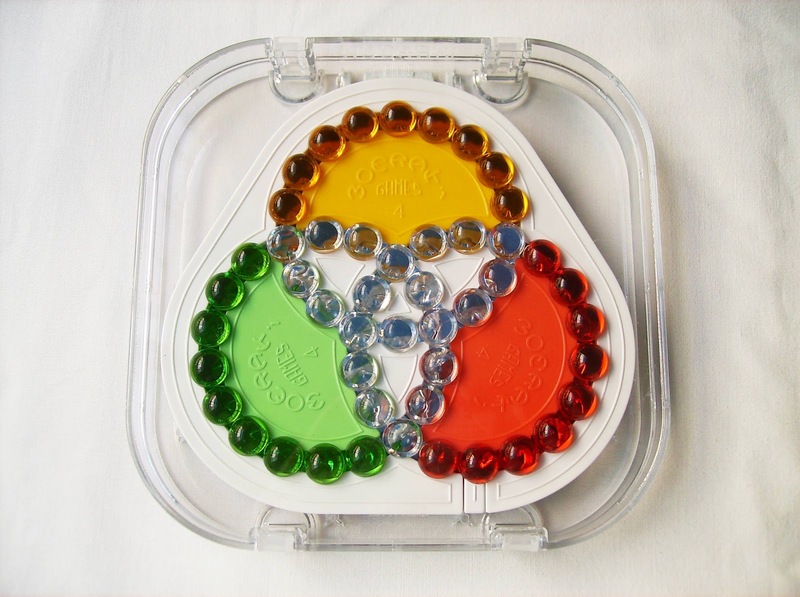 The Moeraki 4 jams a little more, mainly because of its ring design, but still much better than any other bead puzzle. The size is also a plus in the Moeraki games, with a diameter of about 14cm (5.5"). Each puzzle has its own transparent display case and looks great on a shelf. Difficulty-wise, comparing it to the Moeraki 3, at first I thought this one was harder, but after a few solves I could see the difference in complexity. By looking at the two of them, you'd think that the simplicity of the 3 - Just two intersecting loops - would make it easier. However, in this case, looks can be deceiving. In fact, I believe the Moeraki 4 is even easier to solve than the classic Hungarian Rings - I remember having quite a hard time solving that one. The solving strategy is pretty simple too. You'll start by getting any of the outer colors in place, followed by the adjacent color. The trickier part is the last ring, but here you can take advantage of the fact that when permuting beads between any two rings, the third one remains unaffected. Just keep this in mind and you should be able to solve it without any trouble. Solving time after a few practice solves takes no more than five minutes, but you can still solve it faster. Packaged with each of Moeraki comes a correspondent virtual version of the game. You can use it on-the-go, but it can be used as a practice medium if you're worried about messing with the physical version, at first. The PC game features three levels of difficulty, starting with just a two-color game, but it gets increasingly difficulty until you reach level 3 with 7 colors - This level is actually harder than its physical counterpart, which by the way, has only five different colors. 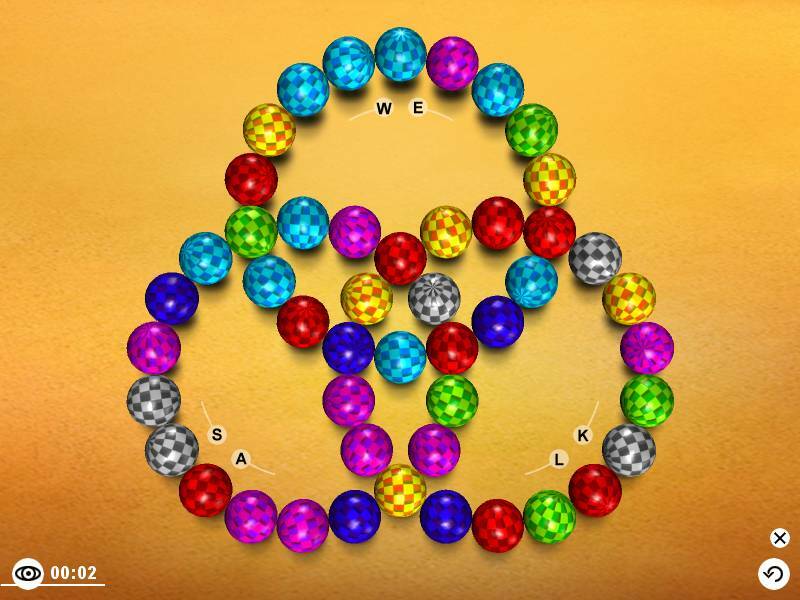 It's a nice alternative way to play the games and get a different interaction: You have the option of selecting a variety of different beads to play the game. Video demonstration of the puzzle's movement. The Moeraki 4 is an amazing puzzle to play with and on top of that, it's beautifully designed to close perfection. It's not overly difficult to solve, but it's a very satisfying experience and I highly recommend it to anyone remotely interested in a challenge. Congratulations Mr. Moscovich and Mr. Landowski, for you have created a masterpiece. Availability: The Moeraki games are available at Casland Games for €15 - A bargain, considering the high-quality of both puzzles. Moeraki 3 and Moeraki 4 by "Geduldspiele"
Akio Yamamoto is the talented designer behind the fantastic Marine Series from Hanayama's extremely popular Cast Puzzles. He designed six themed puzzles with the ocean life as the main focus. These puzzles have the particularity of not being overly difficult - They range between level 1 and 3 out of 6, although they're great to play with. 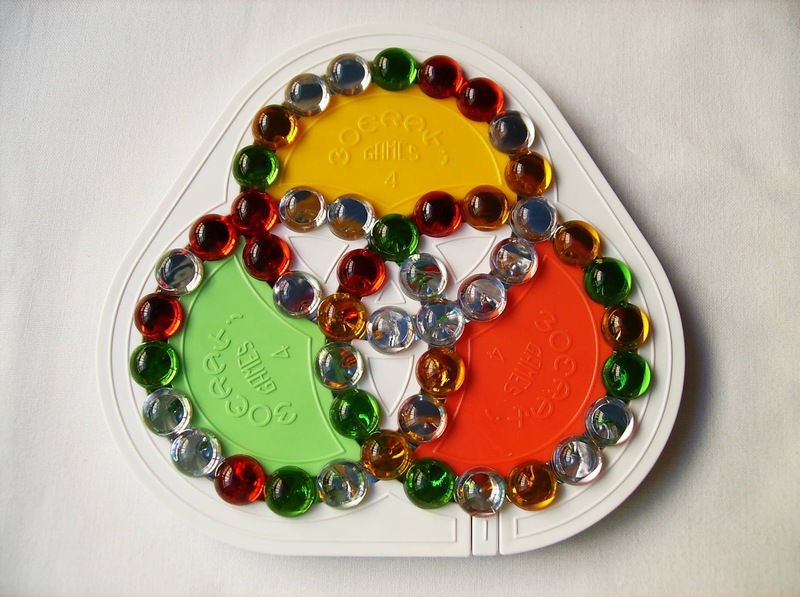 First released in 2000, the puzzles had a much deserved re-release, eight years later, with refined designs and a new coating finish. I have previously reviewed four of the Marine Series' puzzles (please refer to the reviews of the Shark, the Starfish, the Claw and the Seahorse). Today I'll be reviewing the fifth in the series, the Cast Reef (formally known as the Coral), with only the Seabream left to review - stay tuned. The Cast Reef depicts two gobies that were laying eggs in a coral and got stuck due to the current. Your job is to get them out of the coral and then put them back together - Poor gobies. The puzzle follows on the same design principle as the others in the series with one part chrome and the other golden, which makes for a nice contrast and a striking visual effect. You can also use it as a keychain, although bear in mind that that would scratch your puzzle pretty easily. The main part of the puzzle, the coral, has a few bumps and grooves that will difficult your task, so expect a some dead-ends along the way. The first thing you should do is to try and figure out where the two gobies should exit. If you succeed to do this, it's easier to solve the puzzle, because you have an idea of where the gobies should travel, instead of just randomly fiddling with them until you eventually discover the way out. Another thing to keep in mind is to make use of the entire length of the space between the gobies, as it will prove to be crucial in travelling around the coral. Solution: If you still require further help in solving it, you can download a solution at Sloyd's. 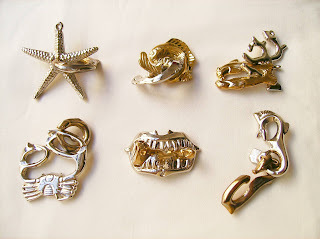 The Marine Series by Hanayama is a wonderful addition to the already marvelous Cast Puzzle collection. My favorite from the six is still the Starfish, but the Reef is a great puzzle too. Akio Yamamoto has really outdone himself and the result is obvious, an extraordinary selection of puzzles that look absolutely gorgeous and a must-have in any collection. 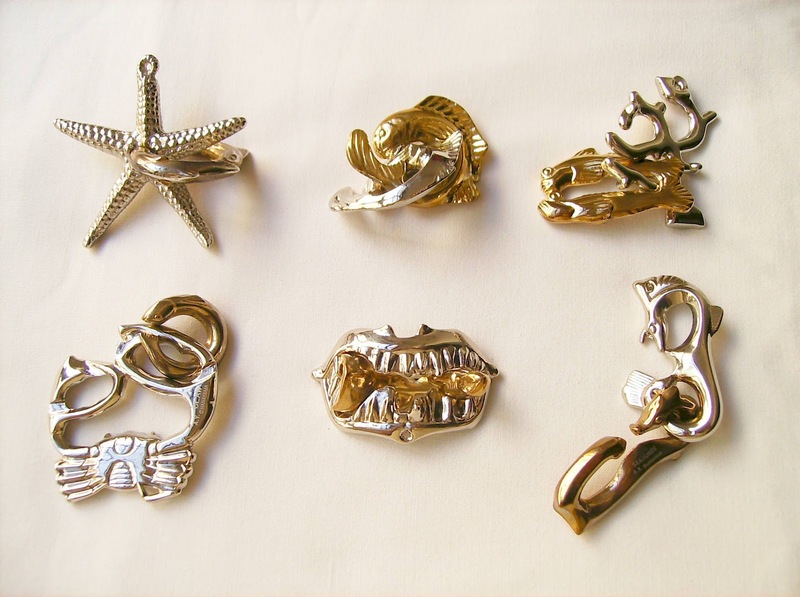 Availability: You can get the Cast Reef at Sloyd's, in Finland, as well as all the others in the Hanayama collection. The Doornail is a very interesting interlocking puzzle from Brilliant Puzzles, and prior to get this version I already knew the concept: In my collection, I have a simpler version with six rods and about half the size. You may also know it as the Computer Chip, which in my opinion is more fitting. The concept of the Doornail is similar to a traditional burr puzzle, where notched rods are interlocked and intersect at right angles. In this version, eight rods are interlocked inside a square box with four on each side. The object is to get all rods out of the box and then return them to their original position. It's a fairly challenging task, but if you carefully analyze it, it's actually quite simple to solve. Its dimensions are 8.5 x 8.5cm (3.3"). Brilliant Puzzles rates this as a level 4/5 difficulty, and in my opinion it all depends on how good you are at solving burr puzzles. Just like any other burr puzzle, to take it apart you need to find the "key" rod. In other words, there should be a plain rod without any notches, which would be the first one out. After you get the first one the others won't be a problem. The real challenge, however, is to get all of the pieces back in their original positions. Again, if you're used to solving burr puzzles, you'll know what to do. The first thing you should do after getting all the rods out is to arrange them by groups: If you look closely you'll see that there's one rod with four notches, two rods with three notches, two with two notches, two with just one and finally the plain rod. Just like when you were taking them apart one by one, reassembling the puzzle requires a specific sequence that needs to be followed, which is the complete opposite of the first task. You'll start by the four-notched rod and work your way to the final plain rod. The strategy is pretty simple: with every new rod you place, you have to make sure you leave all remaining slots free for the other rods. Once you place a rod there's no need to move it again. The Doornail was an enjoyable puzzle and a satisfying challenge. This is a must-have for any burr type puzzle fans and if you fancy a good challenge, it's worth a try. Even if you're a beginner, I'm sure you'll eventually find a way to solve it. Just give it a chance. Availability: You can get your Doornail from the online puzzle store Brilliant Puzzles for just about $9 USD. 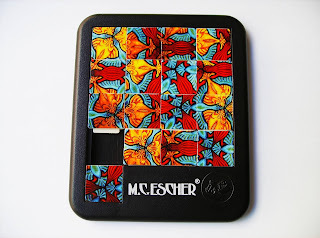 At the end of last year, I reviewed a very interesting packing puzzle, the Interlace Square, which is from an impressive series, the Paradigm Puzzles, by Family Games America. 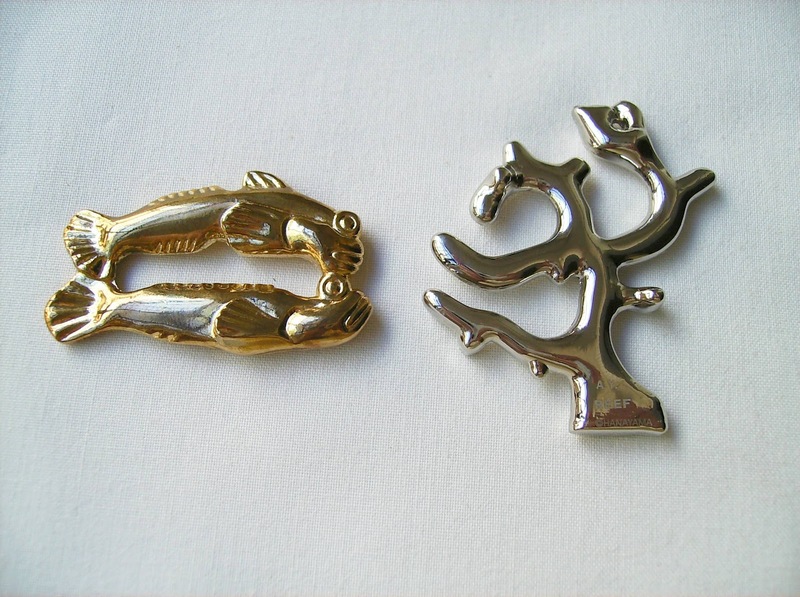 These are actually designed by a very talented puzzle craftsman, William Waite. 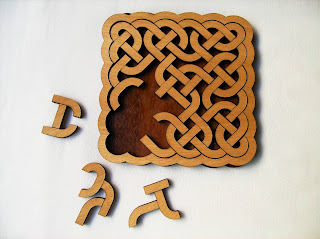 The new puzzle from the series that I'll be reviewing today is the Celtic Knot, another brilliant design. 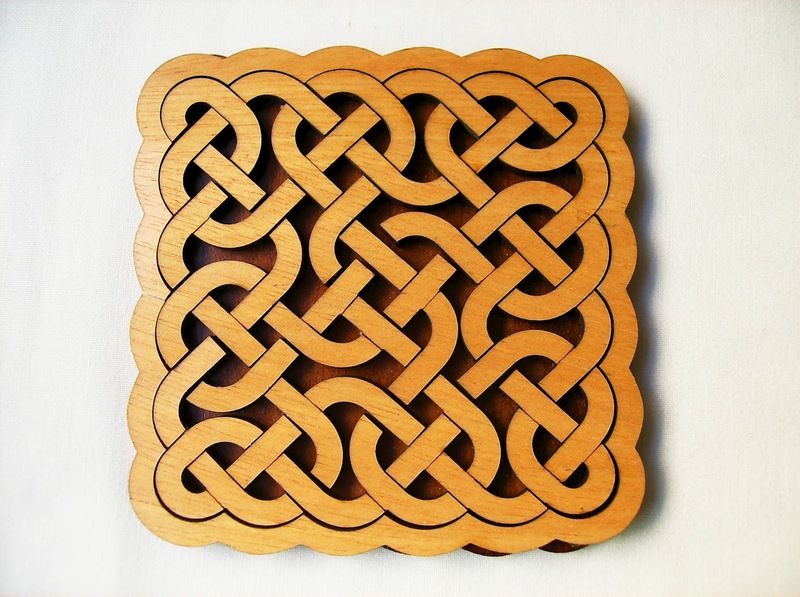 The Celtic Knot has more similarities with the Interlace Square than any other puzzle in the Paradigm series. The overall appearance of both patterns do have some similarities, but the Interlace Square is inspired by Arabic patterns, whereas the Celtic Knot - you guessed it - is inspired by Celtic shapes. The pieces are also quite alike, reminiscent of some kind of ancient alphabet, although the Interlace Square has slightly more curved pieces. All Paradigm Puzzles are precision laser-cut - A requirement for this type of puzzles - and they measure about 10 x 10cm (4"). Like any other packing puzzle, the object is to remove all pieces from the tray and then pack them all inside again. 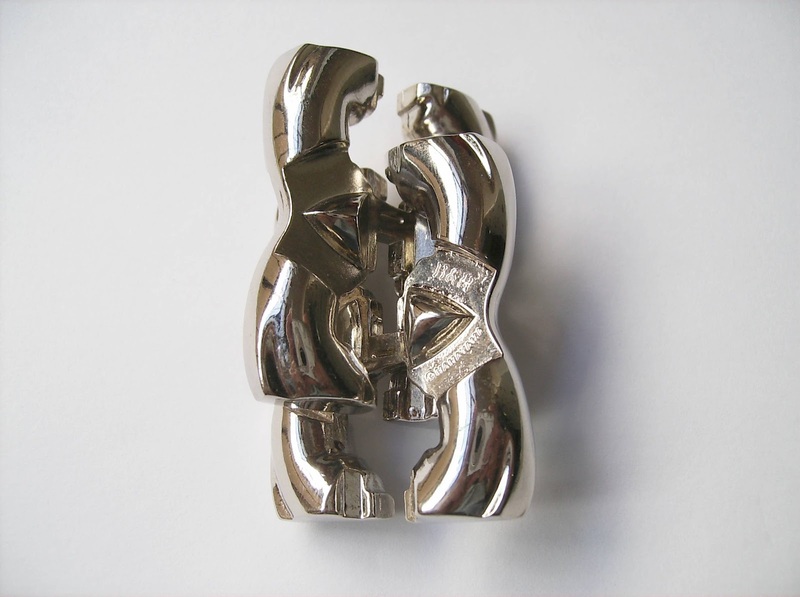 What makes these puzzles rather challenging, however, is their complex shapes. It's just very hard, once the pieces are all mixed up, to remember what exactly the puzzle looks like in its solved state. I would suggest you take a picture of the solved puzzle before you remove all of its pieces - That way you can always turn to it if you find yourself stuck. PuzzleMaster rates all Paradigm Puzzles as a 7/10 level of difficulty, but in my opinion some are harder than others. In fact, all puzzles come with a guide that shows the level on each of the six puzzles and they do vary in difficulty. For example, the Interlace Square is actually the harder in the series with a level 9/10 and the Celtic Knot has a level of 7/10. This is more accurate, and I totally agree, because I found the Celtic Knot a few notches below in terms of difficulty. It took me about half an hour to build the pattern again, although it's the one with more pieces, 16 of them. 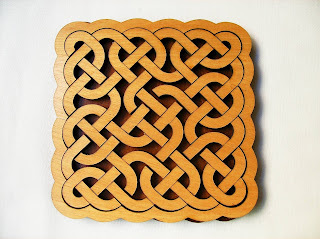 Like the Interlace Square, the Celtic Knot also has one-sided pieces. This is noticeable by the lines that cross the pieces, which depict the actual knots. Not having to use both sides of the pieces can make it easier, but note that in all 16 pieces, no two are alike. The hard part is placing the first few pieces in the frame, but once you get some of them right, it does get easier. After you find a solution, you still have something left to do, because the puzzle has two dissimilar solutions. The Interlace Square is still my favorite in the series, but I really enjoyed the Celtic Knot as well. It's quite challenging to solve, especially if you're a novice, but it's a great puzzle to look at and a must-have for any collection. Availability: As of the time of writing, the Celtic Knot is currently out of stock at PuzzleMaster, but check back again soon, as they restock often. If you like this type of puzzles, you can take a look at the others in the series.